Ranch dressing is a type of salad dressing made of some combination of buttermilk, salt, garlic, onion, mustard, herbs (commonly chives, parsley, and dill), and spices (commonly black pepper, paprika, and ground mustard seed), mixed into a sauce based on mayonnaise, or another oil emulsion. Sour cream and yogurt are sometimes used in addition to or as a substitute for buttermilk and mayonnaise. Ranch dressing has been the best-selling salad dressing in the United States since 1992, when it overtook Italian dressing. It is also popular in the US as a dip and flavoring for chips and other foods. In 2017, forty percent of Americans named ranch as their favorite dressing. In the early 1950s, Steve Henson developed what is now known as ranch dressing while working as a plumbing contractor for three years in the remote Alaskan bush. In 1954, he and his wife Gayle opened Hidden Valley Ranch, a dude ranch at the former Sweetwater Ranch on San Marcos Pass in Santa Barbara County, California, where they served it to customers. It became popular, and they began selling it in packages for customers to take home, both as a finished product and as packets of seasoning to be mixed with mayonnaise and buttermilk. As demand grew, they incorporated Hidden Valley Ranch Food Products, Inc., and opened a factory to manufacture it in larger volumes, which they first distributed to supermarkets in the Southwest, and eventually, nationwide. In October 1972, the Hidden Valley Ranch brand was bought by Clorox for $8 million. 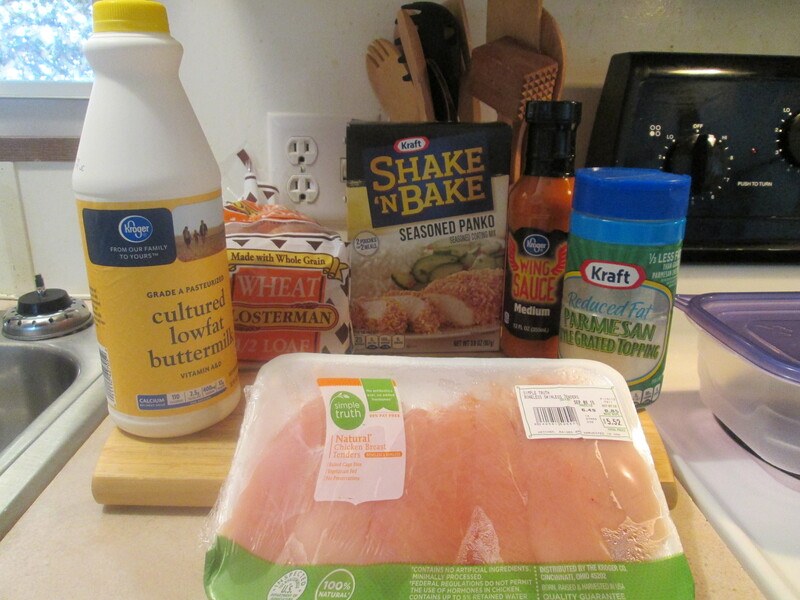 Kraft Foods and General Foods responded with similar dry seasoning packets labeled as “ranch style”. As a result, they were both sued for trademark infringement by the Waples-Platter Companies, the Texas-based manufacturer of Ranch Style Beans (now part of ConAgra Foods), even though Waples-Platter had declined to enter the salad dressing market itself out of fear that the tendency of such products to spoil rapidly would damage its brand. The case was tried before federal judge Eldon Brooks Mahon in Fort Worth, Texas, in 1976. Judge Mahon ruled in favor of Waples-Platter in a lengthy opinion which described the various “ranch style” and “ranch” products then available, of which many had been created to compete against Hidden Valley Ranch. Judge Mahon specifically noted that Hidden Valley Ranch and Waples-Platter had no dispute with each other (though he also noted that Hidden Valley Ranch was simultaneously suing General Foods in a separate federal case in California). The only issue before the Texas federal district court was that Waples-Platter was disputing the right of other manufacturers to compete against Hidden Valley Ranch by using the label “ranch style”. Meanwhile, Clorox reformulated the Hidden Valley Ranch dressing several times to make it more convenient for consumers. The first change was to include buttermilk flavoring in the seasoning, meaning much less expensive regular milk could be used to mix the dressing instead. In 1983, Clorox developed a more popular non-refrigerated bottled formulation. As of 2002, Clorox subsidiary Hidden Valley Ranch Manufacturing LLC produces ranch packets and bottled dressings at two large factories, in Reno, Nevada, and Wheeling, Illinois. During the 1980s, ranch became a common snack food flavor, starting with Cool Ranch Doritos in 1987, and Hidden Valley Ranch Wavy Lay’s in 1994. During the 1990s, Hidden Valley had three kid-oriented variations of ranch dressing: pizza, nacho cheese, and taco flavors. Ranch dressing is common in the United States as a dipping sauce for broccoli, carrots and celery as well as a dip for chips and “bar foods” such as french fries and chicken wings. It is also a common dipping sauce for fried foods such as fried mushrooms, fried zucchini, fried pickles, jalapeno poppers, onion rings, chicken fingers, and hushpuppies. In addition, ranch dressing is used on pizza, pickles, baked potatoes, wraps, tacos, pretzels, and hamburgers. In Germany, Kühne produces a product labeled as Würziges Ranch-Dressing (literally “spicy ranch dressing”). It is based on the common recipe but contains additional tomatoes, red bell peppers, and red pepper. Its color is not white but looks like cocktail sauce. Ranch dressing is produced by many manufacturers, including Hidden Valley, Ken’s, Kraft, Litehouse, Marie’s, Newman’s Own, and Wish-Bone. For Breakfast I made my favorite – Hash Browns, Ham, and Egg. I made some Simply Potatoes Shredded Hash Browns, Heated up some Kroger Diced Ham, fried an Egg Sunnyside Up, made a cup of Bigelow Decaf Green Tea. I made a bed of the Hashbrowns in a bow and sprinkled some Sargento Reduced Fat Sharp Cheddar Cheese. Next I put the Diced Ham over top the Hash Browns then put the Sunnyside Up Egg on to top it off. Out side it was 22 degrees this morning and for the day it was mostly sunny and 37 degrees. Went to Walmart after Breakfast. I needed to get some Christmas Candy Canes and Christmas Decorated Cupcakes for all the kids in the family. Then I dropped those off at my cousin’s house later on. Spent the rest of the day baking. I baked Mini Loaves of Pillsbury Pumpkin Cheesecake and Banana Quick Bread. Along with Mini Loaves of Pillsbury Sugar Free Chocolate Cake, also Sugar Free Chocolate Icing. And finally baked a pan of Pillsbury Sugar Free Chocolate Fudge Brownies. I kept the Brownies for here. I make Mini Loaves of Cakes for Christmas and pass them out to our neighbors. Love doing stuff like this! For Dinner tonight its Fried Thin Sliced Chicken Breast Cutlets w/ Loaded Baked Potato Casserole and Seasoned Pinto Beans. I purchased a package of Simple Truth Chicken Breast Cutlets Thin Sliced at Kroger. I really love using all the Simple Truth items, especially their Chicken and Pork items. To prepare the Chicken Cutlets I’ll need; Morton’s Lite Salt, Ground Black Pepper, Litehouse Poultry Seasoning, Low Fat Buttermilk, Frank’s Hot Sauce, Flour, and Extra Light Olive Oil. Early this morning I poured a 1/2 of Low Fat Buttermilk into a plastic container. Then I added 5 or so shakes of the Frank’s Hot Sauce to the Buttermilk and mixed it together. Next I got my Chicken Cutlets out of the fridge and added the Chicken to the Buttermilk mixture. Sealed the container and put it in the fridge until ready to cook. Okay, to prepare the Chicken I grabbed the container with the Chicken out of the fridge. I got a plate and I removed the Chicken from the Buttermilk mixture, shaking off the excess. Then seasoned them with Salt, Pepper, and Poultry Seasoning. Then rolled the Chicken in flour. I let the Chicken rest for 5 minutes. And as that was happening I got my skillet ready. Sprayed it with Pam Cooking Spray, added a tablespoon of Extra Light Olive Oil, and heated it on medium heat. When the skillet was heated I fried the Chicken. Fried them for 9 minutes and flipped them over and continued to cook them for another 10 minutes. I checked the Chicken with a thermometer and got a 169 degree reading, done. This Chicken turned out great! The Buttermilk/Hot Sauce brine gave the Chicken a fantastic flavor, excellent dish! For a side dish I prepared a box of Idahoan Loaded Baked Potato Homestyle Casserole. Being a Potato Lover like I am, I really enjoy all the Idahoan Potato Products. I’ve made the Loaded Potato many times. To prepare it; Preheat the oven to 450°F. Combined the Potatoes and Sauce mix in a 1 1/2 quart baking dish. Stir in 1 1/2 cups boiling Water, 3/4 cup 2% Milk, and 1 1/2 Tbsp. Blue Bonnet Light Butter with whisk. Bake uncovered for 25 minutes or until the top is golden brown and potatoes are tender. Remove from oven and let stand a few minutes before serving. The sauce will thicken slightly as it cools. Such an easy way to get a delicious Potato Casserole! I also heated up the Margaret Holmes Seasoned Pinto Beans that I leftover from the night before. Just put the leftovers in a small sauce pan and reheated it on medium low heat until heated through. For Dessert/Snack later a bowl of Skinny Pop – Pop Corn and a Coke Zero to drink. There’s no better way to start a savory Loaded Baked® homestyle casserole than with world-famous Idaho® potatoes, which is why you’ll taste only 100% grown-in-Idaho potatoes in this rich, cheesy, bacony side. For family meals or for special occasions, this cheesy, delicious dish is sure to please. 1 – PREHEAT oven to 450°F. COMBINE potatoes and sauce mix in 1 1/2 quart baking dish. 2 – STIR in 1 1/2 cups boiling water, 3/4 cup milk, and 1 1/2 Tbsp. margarine or butter with whisk. 3 – BAKE uncovered for 25 minutes or until top is golden brown and potatoes are tender (sauce will thicken slightly when cooling). 4 – Remove from oven and let stand a few minutes before serving. 1 – HEAT potatoes and sauce mix, 1 1/2 cups hot water, 3/4 cup milk, and 1 1/2 Tbsp. margarine or butter to boil in 2-quart saucepan over high heat, stirring occasionally. Watch carefully to avoid boil over. 2 – REDUCE HEAT, then COVER and simmer 15 minutes, stirring occasionally, until potatoes are tender and sauce reaches desired consistency (sauce will thicken slightly when cooling). 3 – Remove from heat and let stand a few minutes before serving. When cake mix calls for water use buttermilk instead. It will make the lightest and best cakes. Plus it will give it that homemade taste. 1) In large bowl, combine flour, baking powder, baking soda and salt. 3) Gradually add flour mixture alternately with buttermilk, beating until smooth. Spoon half batter into a lightly greased and floured 9-inch cake pan. Top evenly with 1 cup raspberries. Spoon remaining batter over raspberries and top with almonds, remaining 1 cup raspberries and turbinado sugar. 4) Bake 50 minutes or until cake tester inserted in center comes out clean. Buttermilk can be substituted for 2 percent or whole milk in most pastry or bread recipes. Buttermilk is less than 1 percent fat, almost equal to skim milk, but has a thicker consistency. Creamy buttermilk dressing pairs well with juicy strawberries and crisp spinach. 1) In blender container, combine ¾ cup strawberries, cream cheese and buttermilk; process until smooth. 2) In large salad bowl, toss together spinach, onion and remaining 1¼ cups strawberries. Serve with dressing. The term buttermilk also refers to a range of fermented milk drinks, common in warm climates (e.g., the Balkans, the Middle East, Turkey, Afghanistan, Pakistan, Nepal, India, Sri Lanka, Nicaragua and the Southern United States) where unrefrigerated fresh milk sours quickly, as well as in colder climates, such as Scandinavia, Ireland, the Netherlands, Germany, Poland, Slovakia, Slovenia, Croatia and the Czech Republic. This fermented dairy product known as cultured buttermilk is produced from cow’s milk and has a characteristically sour taste caused by lactic acid bacteria. This variant is made using one of two species of bacteria—either Lactococcus lactis or Lactobacillus bulgaricus, which creates more tartness. The tartness of buttermilk is due to acid in the milk. The increased acidity is primarily due to lactic acid produced by lactic acid bacteria while fermenting lactose, the primary sugar in milk. As the bacteria produce lactic acid, the pH of the milk decreases and casein, the primary milk protein, precipitates, causing the curdling or clabbering of milk. This process makes buttermilk thicker than plain milk. While both traditional and cultured buttermilk contain lactic acid, traditional buttermilk tends to be less viscous, whereas cultured buttermilk is more viscous. Buttermilk can be drunk straight, and it can also be used in cooking. Soda bread is a bread in which the acid in buttermilk reacts with the rising agent, sodium bicarbonate, to produce carbon dioxide which acts as the leavening agent. Buttermilk is also used in marination, especially of chicken and pork, whereby the lactic acid helps to tenderize, retain moisture, and allows added flavors to permeate throughout the meat. In a hurry to make a recipe that calls for Buttermilk and you’re out……. In a pinch you can use regular milk with lemon juice. Marinate red meats in wine to tenderize. Marinate chicken in buttermilk to tenderize. Another hot and humid day out, might as well get used to it as it’s settled in here for a while they say. For Breakfast I made a Breakfast Sandwich consisting of Egg Beater’s Egg Whites (1 serving), 2 Slices of Simple Truth Canadian Bacon, 1 slice of Sargento Colby Longhorn Ultra Thin Cheese, and all on a toasted Healthy Life Whole Grain English Muffin. Love that Canadian Bacon! After my morning workout went outside and cleaned up the driveway and around the house before it got too humid, lot of leaves out there already! Back in helped out Mom with laundry and did some light cleaning around the house. 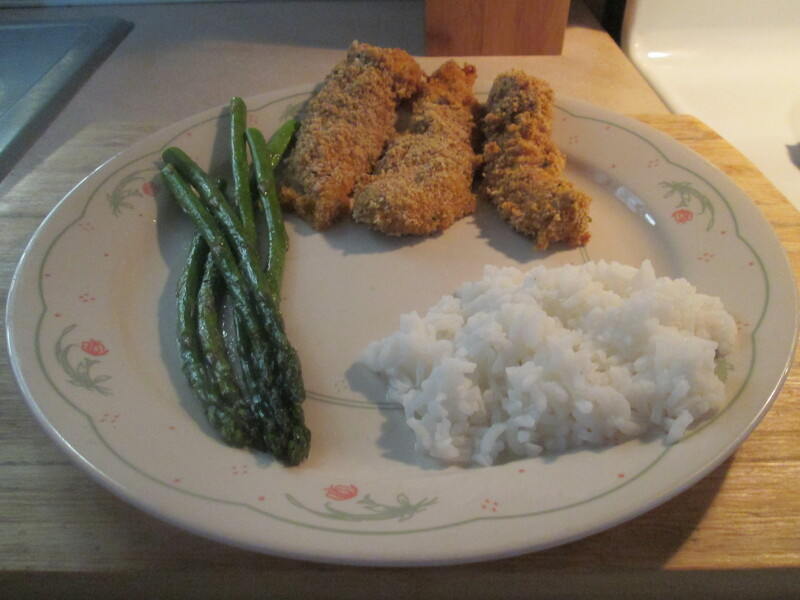 For dinner tonight it’s Spicy Baked Buttermilk Chicken Tenders w/ White Rice and Asparagus. I had picked up a package of Simple Truth Chicken Breast Tenderloins at Kroger the other day. To prepare them I’ll need; 1 Cup Low – Fat Buttermilk, 1/2 Cup Hot or Medium Wing Sauce (I used Kroger Brand Hot Wing Sauce), 1 Cup Whole Grain Bread Crumbs (I made my own by putting 2 slices of Whole Grain Bread in a Food Processor), 1 Package Shake and Bake Panko Bread Crumbs, 3 tablespoons Kraft Grated Reduced Fat Parmesan Cheese, Sea Salt and Ground Black Pepper (to taste), and 2 Tablespoons Canola Oil. A combination of some great ingredients, that will give the Chicken a fantastic flavor! Then for one side dish I prepared Roasted Asparagus. To prepare the Asparagus I needed Extra Virgin Olive Oil, Garlic (minced), Sea Salt, Freshly grated Black Peppercorn, Lemon Juice, and Shredded Parmesan Cheese. To prepare it; Rinse clean the asparagus. Break the tough ends off of the asparagus and discard. 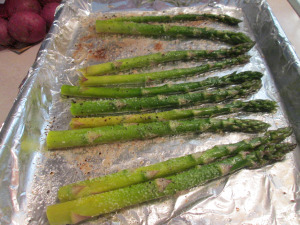 Lay the asparagus spears out in a single layer in a baking dish or a foil-covered roasting pan. Drizzle olive oil over the spears, roll the asparagus back and forth until they are all covered with a thin layer of olive oil. Sprinkle with minced garlic, salt, and pepper. Rub over the asparagus so that they are evenly seasoned. Place pan in the preheated 400 degree oven and roast for approximately 8-10 minutes, depending on how thick your asparagus spears are, until lightly browned and tender when pierced with a fork. Drizzle with a little fresh lemon juice and shredded Parm Cheese before serving. 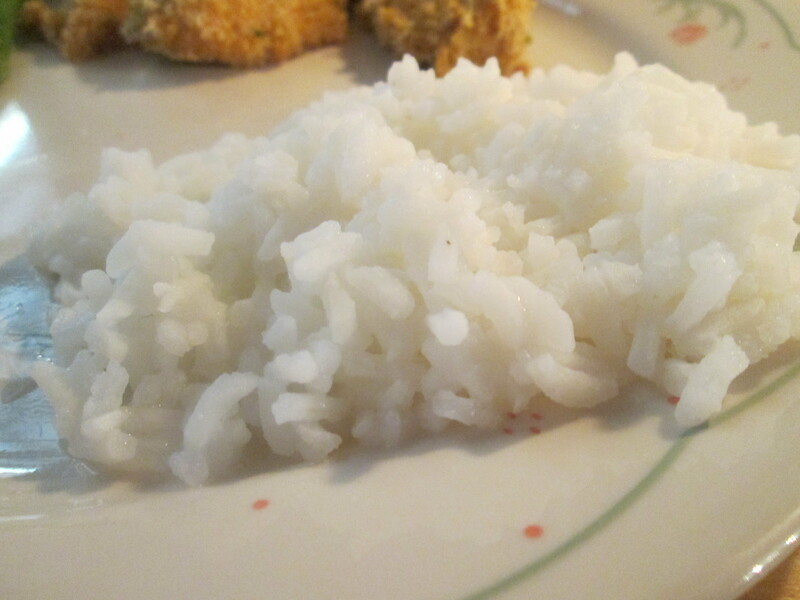 Then for the other side I prepared some Uncle Ben’s White Rice. I usually have Brown Rice but Mom and dad like White Rice so White it is! Easy to prepare; Just bring Water and Rice to a boil. Reduce heat and cover for 20 minutes and done! Rice is so good! For dessert later a Dole Mini Banana and a Honey Crisp Apple Slice. * Mix buttermilk and hot wing sauce together in a shallow pan. Add in chicken, coating well. Marinate in the refrigerator for 1 to 1-1/2 hours. * Preheat oven to 400 degrees. Combine bread crumbs, panko, and Parmesan cheese well in a shallow dish or loaf pan. 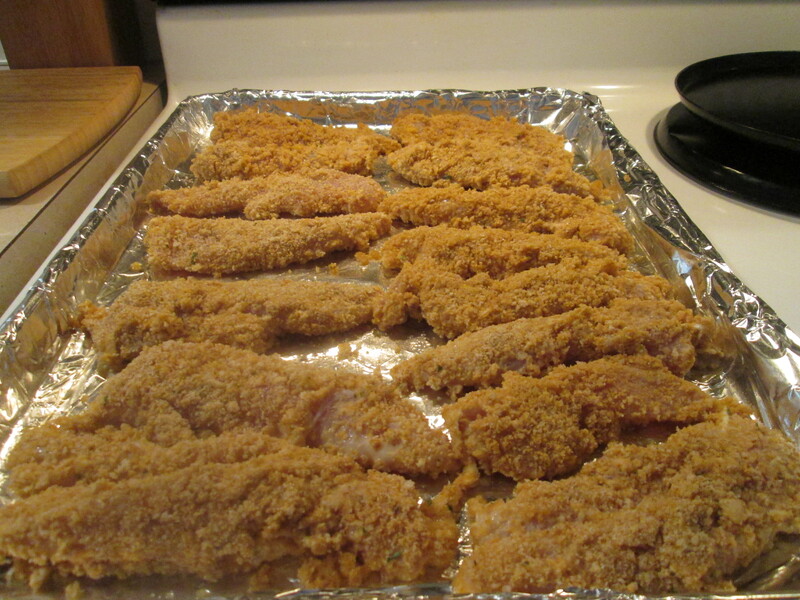 Allow excess marinade to drip off each chicken strip before dredging it in the crumb mixture. Season to taste with Salt and Pepper and then dredge the strips in the crumb mixture. * Spread 2 T. oil over the bottom of a large baking sheet. Heat in the oven for 5 minutes. 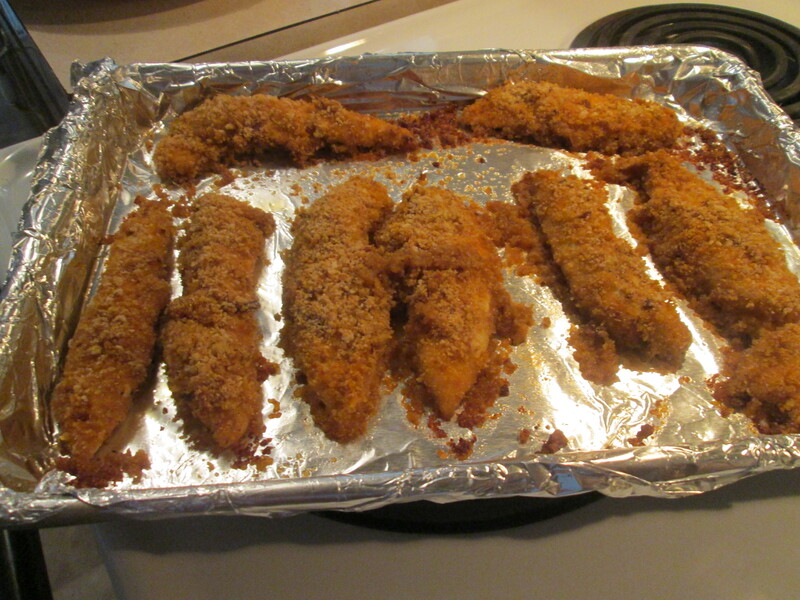 Remove baking sheet from the oven and place the coated chicken strips in a single layer. * Bake for 15-20 minutes until cooked through (165 degrees). For premium quality rice that delivers consistent results and cooks perfectly every time, look no further than UNCLE BEN’S®. Available in 1, 2, and 3 pound boxes, and 5, 10 and 12 pound bags. UNCLE BEN’S® ORIGINAL CONVERTED® Brand Long Grain White Rice supports a healthy heart* and a well-balanced diet. It is enriched with vitamins and iron, naturally fat-free, and certified by the American Heart Association. American Heart Association: Meets American Heart Association food criteria for saturated fat and cholesterol for healthy people over age 2. 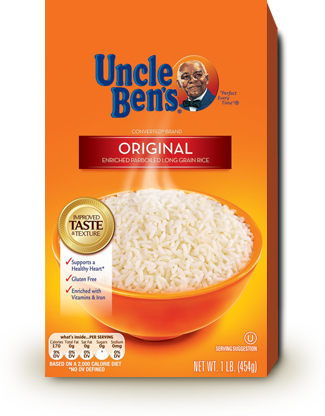 UNCLE BEN’S® uses premium rice grains grown in the U.S.A.